We are a midsize, metal-working company located in Vaihingen/Enz (near Stuttgart, Germany) with 120 employees and an annual turnover of about 18 million €. Our array of services ranges from stamping tools to intricate progressive/compound die stamping tools with part and conveyor feed systems, up to complex forming tools. For more than 80 years Kölle GmbH has been active as a midsize, owner-operated family business in the toolmaking and metal stamping sector. We manufacture high quality tools and series stamping parts for our customers from the automotive, the aerospace industry as well as the electrical engineering branch. We have many years experience and technical know-how particularly in the product ranges of seal support frames, metal parts for heat shield insulations and tubular rotors for pumps. The service portfolio includes the entire process chain. It starts with the inquiry, extends to project planning, enters into the development/engineering phase, proceeds to tool design and initial sample inspection up to series production and includes the entire service life of the item. At our factory location in Vaihingen, Germany, our team of 120 employees generates an annual revenue of approximately €18 million. Our management policy is characterised by a strong customer focus and a partner-like relationship with our suppliers. One of our highest priorities is the training and professional development of our employees. When considering that 9% of our employees comprises apprentices, we have assured a highly qualified junior staff. 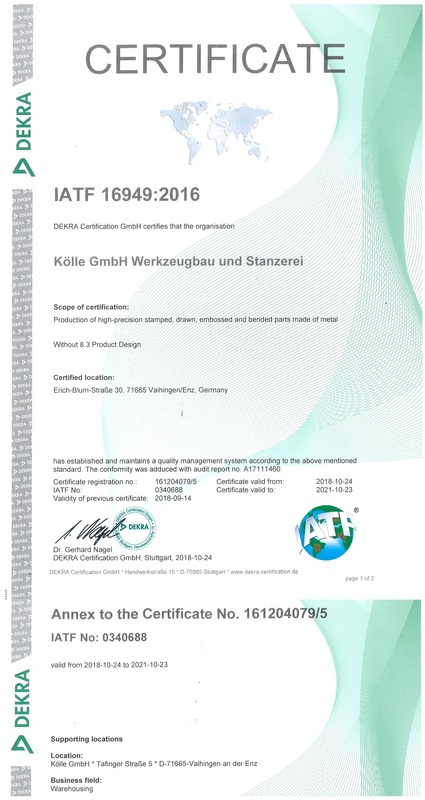 Not only do we feel responsible toward the automotive industry and to meet the high quality standards it demands, which is subject to annual certifications/internal audits, we also consider ourselves as an enterprise that is socially responsible and must provide a large contribution to the protection of the environment and resources. Our Environmental Management System has been validated for many years. Now, our certified Energy Management System also has become a significant component of our company policy and our daily business. The quality of our products and services is an integral component of the Kölle corporate culture. In order to meet in the continuously rising demands, we focus on customer satisfaction and the holistic approach in quality management. We can look back at decades of experience in the automotive sector. This is also reflected, among other things, in our decision to have our Management System certified in compliance with the highest industry requirements. 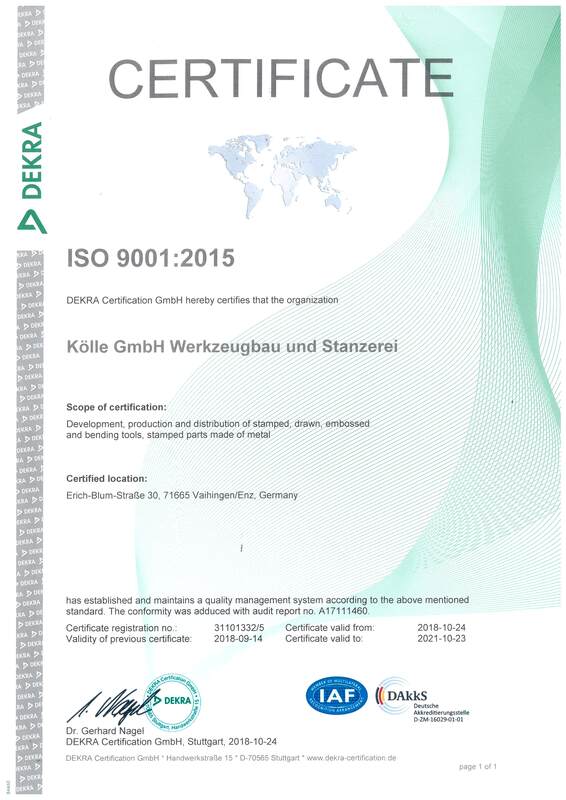 Since 1998 DIN EN ISO 9001 is a fixed component of our company and in 2004 ISO TS 16949 (IATF 16949 since 2018) became the foundation for our daily office procedures. Our numerous measurement data bring the system to a full circle, like for example the use of 3D measuring machine. Furthermore, within the terms of our sustainable corporate culture, environmental awareness is firmly integrated into our Management System. 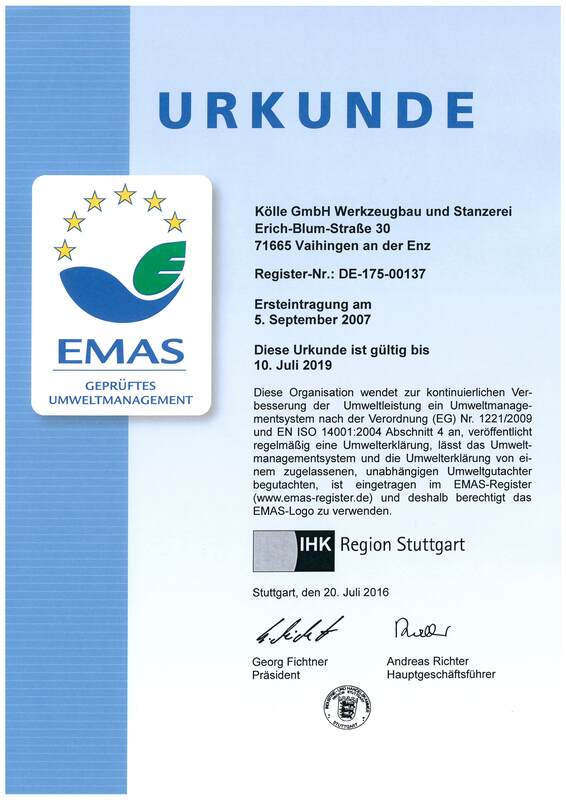 Since 2007, our Environmental Management System is validated according to the Eco-Management and Audit Scheme (EMAS), which also includes the environmental standard DIN EN ISO 14001. 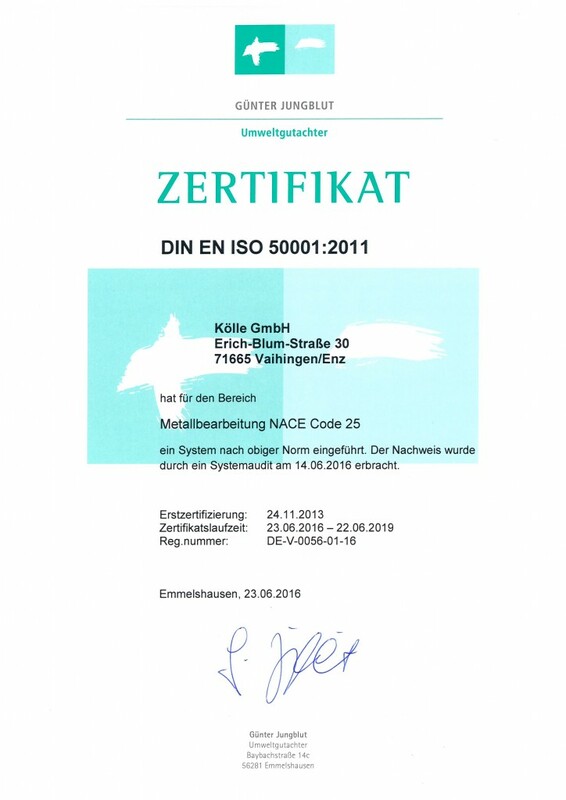 Since 2013 we are compliant with the requirements pertaining to an energy management system according to with DIN EN ISO 50001. Based on our Environmental Management System we agree not only to meet but also exceed the legal requirements demanded from our environmental performance. We communicate our environmental data and activities in our Environmental Product Declaration. This document is updated annually and can be downloaded from our website. Born in 1955 and raised in the Eifel, a low mountain range in western Germany, Kurt Göbgen studied at the Bundeswehr University Munich. 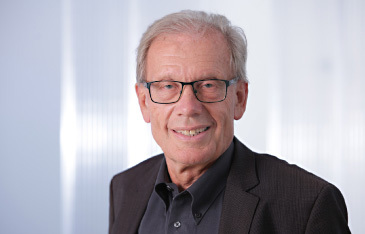 Subsequently, working as a manager in the material handling department and as business organisational manager of a large logistics institution of the Bundeswehr, he gained a lot of practical experience. In the following years he expanded his knowledge, working as manager in the centre logistics department or as head of the materials handling department in companies acting worldwide. 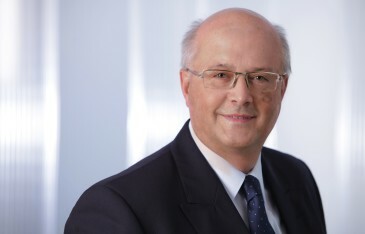 Since 2001 he is the Managing Director at Kölle GmbH, responsible for the commercial business of the company as well as quality assurance and environmental management. Born in 1939 and raised in Enzweihingen, Germany, Rolf Kölle completed his apprenticeship as a tool-and-die maker in his parents‘ business. Later on he joined another firm to become an engineering draughtsman. Finally, after successfully completing his engineering studies, he joined his parents‘ business in 1963. Since then he has managed the technical and business affairs of the company. To this day, his vast experience and his keen engineering know-how during the planning and implementation of projects is in great demand. Born in 1983 and raised in Vaihingen/Enz, Germany, Matthias Kölle successfully completed his studies in November 2009. 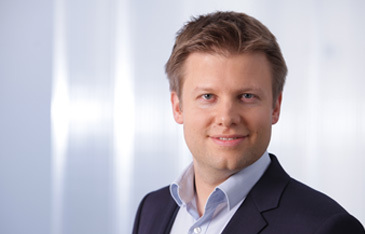 Subsequently, he joined the company as Project Manager In 2010 Mr. Kölle became the company’s „Prokurist“ and since 2013 he is the acting Managing Director. He is the third generation to manage the family business. His responsibilities include the project management and marketing aspects.